$SPY closed over the 250 day SMA which is bullish long term trend reversal signal based on backtesting. Two bullish moving average crossover signals were triggered with the 10 day / 200 day SMA cross and the 10 day / 250 day SMA crossover. The volume on the up swing on Thursday and Friday was higher and the previous down days last week. 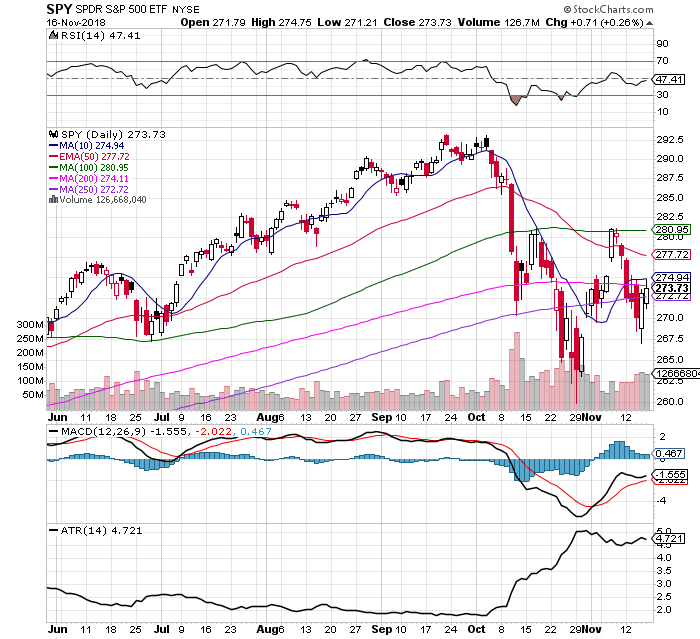 However $SPY remains under the 10 day EMA and the 200 day SMA. They both held as end of day resistance Friday. The trading range has declined in November versus the October high with the ATR not making a new high this month. Excluding the post mid term election run up and the following day price has closed under the RSI every other day since October 4th. This shows a lack of follow up momentum on every rally. The MACD has been under a bullish crossover since November 2nd days after the recent lows. $SPY closed under the 200 day SMA in October for bearish end of the month close. A close back over the 10 day and the 200 day SMA would confirm another potential bullish reversal. A close below the 250 day SMA is a no go zone for bulls.